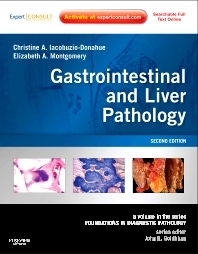 Gastrointestinal and Liver Pathology, a title in the Foundations in Diagnostic Pathology series, provides all the most essential information on the pathological entities encountered in practice in an easy-to-use format. Drs. Christine A. Iacobuzio-Donahue and Elizabeth Montgomery examine the full scope of neoplastic and non-neoplastic disorders of the gastrointestinal tract--, including disorders of the tubular gastrointestinal tract, pancreatobiliary tree, and liver—from clinical features and ancillary studies to differential diagnoses and prognostic and therapeutic considerations. The consistent, practical format with a wealth of illustrations, boxes, and tables make this title ideal for quick reference for both novices and experienced pathologists. Get the full range of coverage on neoplastic and non-neoplastic gastrointestinal/liver conditions in a consistent, user-friendly format. Catch all the nuances of how pathological entities present through over 850 full-color illustrations. Reference key information quickly and easily thanks to at-a-glance boxes and tables throughout the text.